Today is the day that the world stopped, where things went bad before they could become good. The skies darkened, the veil was torn, His body was pierced, the divide between heaven and earth collided in the death of the king who was the Son of God, who was in fact God himself, come to offer up Himself, in forgiveness, mercy and love for even us who knew not what we did as we scorned and mocked Him. This is that dark and mysterious day that we call good, and that we both mourn and celebrate as our Lord Jesus, the Saviour of the world, was put into the tomb. Oddly enough, those who claim that there is no such thing as absolute truth, make scores of decisions every day on the basis that they believe some things are true and some are false. We all do. I will not turn on a light without believing in the reality of electricity, or drive a car without believing in the effectiveness of the combustion engine. Mathematicians undertake the most complicated of calculations based on the belief that their theorems and formulaes are sound. No one undergoing brain surgery would want to be operated on by a surgeon who did not believe that some things about the brain are true and some not true. And yet, when it comes to the most important issues of life - What is the meaning of life? Why are we here? Does it matter whether I am good or bad, or is there any such thing as goodness and badness? What happens when I die? Will I be called to account before God for my actions and omissions in life? Does God exist anyway? - it is assumed that either, we can't know or it doesn't matter anyway. Figuring out something that “works for me” is all that is required. Or I can assume the attitude of Marilyn Monroe who is said to have declared, "I believe in everything - a little bit." Though a powerful man in a position of great authority, Pilate has the same fears that all humans have; fear for his job, fear for his life, fear of shame and humiliation, and his test is going to force him to choose between his allegiance to his fears, or his allegiance to the truth. Waiting for him to make his decision is the Son of God who calmly watches with grace as Pilate struggles. An accurate sample of the human race, Pilate is a divided man. One side wants to free an innocent man. But the other side doesn’t want to pay the price to do it. What follows is the deepening of the psychological torment Pilate endures as he knowingly gives away his authority to be used to crucify Jesus. How often in our lives do we place strategic objectives such as power, money, or even the desire to be popular, ahead of truth and doing what is morally correct? The truth that makes men free, is for the most part, the truth which men prefer not to hear. So what is the Truth that is revealed by Good Friday? It is not a thing or an idea or a philosophical concept. It is a person. It is Jesus. Good Friday reveals the truth about Jesus. It would be on the cross, Jesus hanging naked and powerless, a picture of mortality and humanity at its worst, that the divinity of Christ will be revealed. The cross reveals the truth. Good Friday reveals that the truth of Jesus is not just some nice idea that tickles our curiosity and challenges our intelligence; it is a truth that saves us. Christ’s sacrifice on the cross will be our redemption and our salvation. Good Friday reveals the truth that the incarnation of the second person of the Trinity did not end at Christmas but is completed, accomplished and perfected by His mortal death on the cross. The answer to human suffering lies upon the cross, God suffers with us, God has chosen to accept death for us. Good Friday reveals the truth about how life is decisive. We can choose to make decisions based on convenience, popularity, or for personal profit but the most important decisions in life, those that really matter, those that ensure eternal life, are the decisions we make in accepting, defending and dying for the truth. Finally, Good Friday reveals the truth about love. Love is not just a strong emotion. Love is a sacrifice and the greatest sacrifice or the greatest love one can express to the other is by giving up one’s life so that the other may live. Truth isn’t truth unless you are willing to die for it. Pilate didn’t see any of these at the time, the irony that the false security his earthly empire afforded him left him still unable to discern Truth when it stood before him. But the passion narrative wants us to see it today, in the midst of the clamouring powers of day that demand our attention and offer us no reply. This is what the cross will mean. This is what truth is and does. Truth is what Jesus is; and our Lord Jesus is dying for Pilate, for Barabbas, for Judas, for Israel, and for the world ........and, for you and me. So come, and cast your eyes upon the splendour of this truth, the Truth revealed on the cross. Behold! 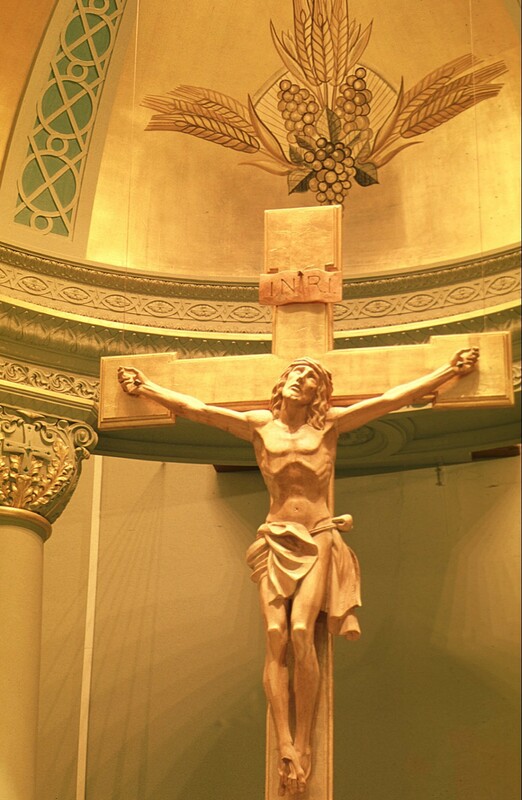 Behold the wood of the cross, on which hung our salvation! Behold Christ, your redeemer and saviour! Behold He who is the Way, the Truth and the Life! Behold the answer to your pain and suffering! Behold, He who is Love and for the sake of Love, died for us!